It is said that he who wears the Celtic Crown will save the Princess in the mountains. Click here to play! When your father died of madness and you inherited his title, you did not believe the stories. It's becoming harder and harder to disbelieve, though, as the sounds of a ghostly harp keep calling you to journey to the mountains. You cannot deny that you've been having some bizarre dreams, either. A red headed girl of surpassing beauty appears to you, and she's always playing the same harp music you can hear coming from the mountains. She beckons you to come join her on a pile of gold and jewels higher than a castle, but you always wake up just before reaching her. It's obviously all come to a head now, as you and a group of fighting men have prepared to go on a trip into the mountains to find your dream Princess. The men wouldn't dare to laugh at their Prince, but you know they think you've gone soft in the head like your father. You'll just have to prove them wrong and follow the ghostly harp. What good is a Celtic Crown if a Prince cannot have his Princess, eh? The Harp symbol acts as a scatter symbol that triggers a random number of free spins. Also, scatter symbols payout prizes on the total bet, at twice the bet for 2 symbols, 5 times the bet for 3 symbols, 20 times the bet for 4 symbols, and 100 times the bet for 5 scatter symbols across the reels. The Princess symbol is wild and only appears on reels 2, 3, and 4, substituting for all symbols except for Harp symbols. 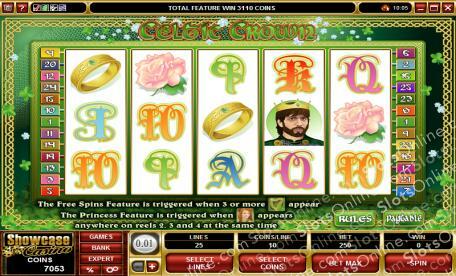 When Princess symbols are on reels 2, 3 and 4 simultaneously, the Princess bonus game is triggered. In the Princess bonus game, 6 knights appear, and the player must choose 3 of them. They each present a prize to the Princess, which means bonus cash for the player. There is also a gamble feature that allows the player to gamble winnings on guessing whether a playing card will be black or red. A correct guess wins double the stake, but an incorrect guess loses the stake. Autoplay can be set for up to 500 spins. It may also be set to stop on a win of a certain amount.